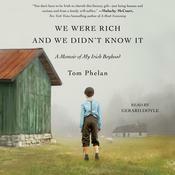 In the tradition of Frank McCourt’s Angela’s Ashes and Alice Taylor’s To School Through the Fields, Tom Phelan’s We Were Rich and We Didn't Know It is a heartfelt and masterfully written memoir of growing up in Ireland in the 1940s.Tom Phelan, who was born and raised in County Laois in the Irish midlands, spent his formative years working with his wise and demanding father as he sought to wrest a livelihood from a farm that was often wet, muddy, and back-breaking. It was a time before rural electrification, the telephone, and indoor plumbing; a time when the main modes of travel were bicycle and animal cart; a time when small farmers struggled to survive and turkey eggs were hatched in the kitchen cupboard; a time when the Church exerted enormous control over Ireland. We Were Rich and We Didn't Know It recounts Tom’s upbringing in an isolated, rural community from the day he was delivered by the local midwife. With tears and laughter, it speaks to the strength of the human spirit in the face of life's adversities. In the tradition of Frank McCourt’s Angela’s Ashes and Alice Taylor’s To School Through the Fields, Tom Phelan’s We Were Rich and We Didn't Know It is a heartfelt and masterfully written memoir of growing up in Ireland in the 1940s. Tom Phelan, who was born and raised in County Laois in the Irish midlands, spent his formative years working with his wise and demanding father as he sought to wrest a livelihood from a farm that was often wet, muddy, and back-breaking. It was a time before rural electrification, the telephone, and indoor plumbing; a time when the main modes of travel were bicycle and animal cart; a time when small farmers struggled to survive and turkey eggs were hatched in the kitchen cupboard; a time when the Church exerted enormous control over Ireland. We Were Rich and We Didn't Know It recounts Tom’s upbringing in an isolated, rural community from the day he was delivered by the local midwife. With tears and laughter, it speaks to the strength of the human spirit in the face of life's adversities. Tom Phelan, voice artist and audiobook narrator, is the breakout young actor on ABC’s The Fosters who, at seventeen, was one of the first transgender teens on prime-time television and an instant role model for many other trans teens. He manages a Tumblr account on which people can ask questions and look for support regarding their own questions of sexual identity.